Cast: Stephen Chow, Wah Yuen, Qiu Yuen, Kwok Kuen Chan, Siu Lung Leung, Dong Zhi Hua, Chiu Chi Ling, Chi Chung Lam. Story: A small village defends itself from the nasty Axe Gang. Kung Fu Hustle has made more money than any other Hong Kong film. Does that mean it's any good? Well, many will say yes and many will say no. I say it's worth a watch purely for its novelty value. Ignore the trailer - it makes it look like a childish fighting movie - Kung Fu Hustle is as eclectic and refreshing a film as you'll see this year. Drawing from sources as diverse as Hero, West Side Story, The Shining and even Road Runner, Kung Fu Hustle is a non-musical musical that slowly morphs into a live action cartoon over the duration of the movie. Presented with a deep tract of fun, we're never supposed to take proceedings at all seriously. Characters jump and fling each other around like toys - in Hero and Crouching Tiger this technique just looked stupid, but here as we are playing with such a daft deck already, it doesn't jar nearly as much. The iffy wire work is complemented by some marvellous computer effects, exaggerating events to Final Fantasy proportions and enabling some very nifty sequences that would have been impossible a few years ago. Whilst it is a comedy, it's not as funny as many - the humour is more amusing than uproarious and comes largely from the novelty and unfamiliarity of the style rather than the quality of the rather immature (but fun) material. The story, which is essentially a village being picked on by increasingly mean bad guys, is largely irrelevant, but works well as a means to string the fun fighty bits together. There is a great deal of violence, but most of it is cartoony - think of it as a mix of Laurel & Hardy, Tom & Jerry and South Park and you'll have the right idea. The 15 certificate is appropriate. 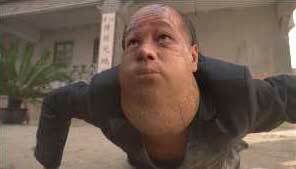 Kung Fu Hustle is one of those extreme rarities - an original movie. Whilst most of the individual parts have been seen elsewhere, they've never been combined in this way before. Go in with an open mind and don't be put off by the rather weak opening 10 minutes and you might find a surprise hit on your hands. Testosterone Satisfaction Rating: 2/5 Plenty of bone-crunching. To enjoy this film you should: not prejudge it. 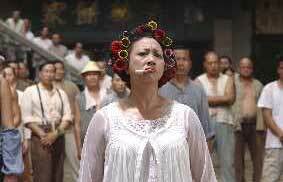 Kung Fu Hustle is on general release in the UK now.